'The Scale of Intervention' was originally exhibited as part of 'CutUp Machine', an exhibition by the CutUp collective at Seventeen Gallery, London (2nd - 26th November 2005). The 16mm film functioned as a working sketch for possible action by the collective, who focused largely on the creative potential of the street as a site for interventionist art and disruption. 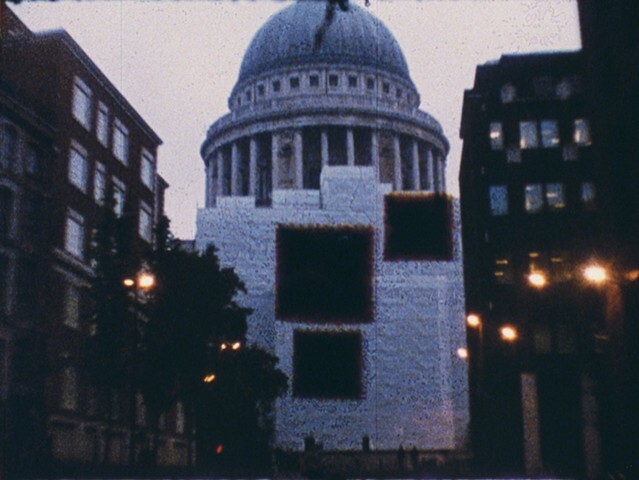 The image of St Pauls Cathedral, partially obscured by a vinyl scaffold wrap, operates as a conceptual blank canvas ready for interruption. The squares that begin to punctuate the filmic instant visually resemble an experimental score and are used to represent the act of puncturing or cutting into an image to reveal a new order or reality beneath.